← Edward vom Hofe & Lorenzo Mitchell-Henry. I recently bought a quantity of reels at Angling Auctions for a friend. He was only interested in two of them and so we came to an agreement regarding the other four. Three were nothing special but one was intriguing. Called the Expert it was made by the River Company in Gothenburg Sweden, this company was in turn owned by Malte Blohm. I started to play around with the reel and eventually decided to dismantle it. What I found was amazing and gradually I formed an opinion of how it worked. After cleaning and reassembling the reel I thought it was time to put some line on and try it out. I selected an Abu Brilliant 5 ½ foot glass fibre casting rod with an Abu 12 gram casting weight, in keeping with the era, First cast and the biggest bird’s nest tangle I have ever seen in my life appeared before me. Eventually I managed to work out how to use the reel and I was impressed with its performance. 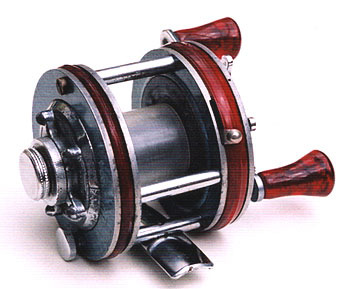 The reel body is made from cast alloy with a hammerite finish. The handle end plate holds the multiplying gear, the tiny cog that drives the spool and the star drag. 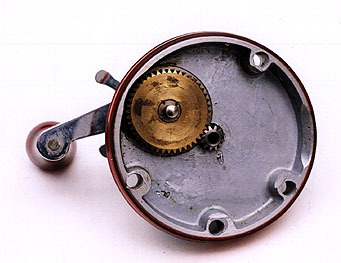 The drive gear shown on the inside of the handle plate. 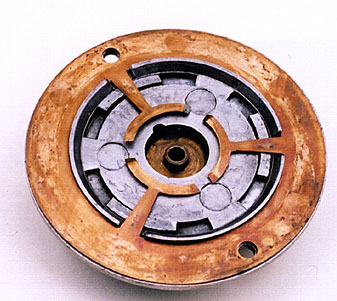 The inner plate holds the spool brake, spindle bushing and large drive cog bushing. The spool brake is the only means of stopping the line running off the spool. The inner handle plate showing spool brake and bushing. The spool showing the centrifugal tufnol brake. 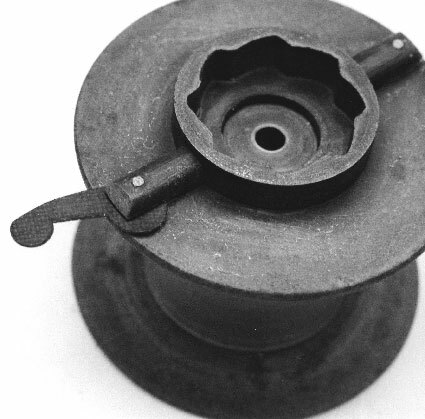 The centrifugal brake and the slot on the spool. The opposite plate holds a very ingenious brake. The picture shows the five components that make up the entire outer end plate. The actual brake is made of extremely thin copper that has been punched out of a sheet to some very fine tolerances. 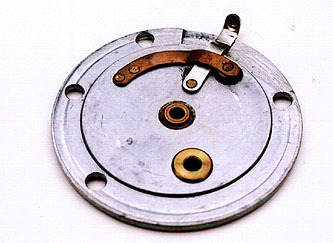 The reel endplate showing the complete brake assembly left to right; combined bushing and seal cap, locking ring, brake ring, endplate housing piece and copper brake pad. The brake ring acts upon the radial arms of the sheet copper; this has three inclined protrusions that slot into the end plate. The copper in turn acts upon the spool; the required tension is set before the cast. There is a locking ring that holds the preset brake position. 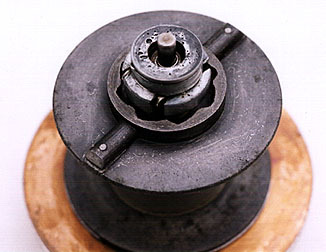 The spool with spindle mount. 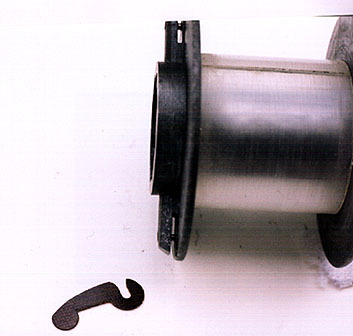 The spindle mounted in the spool showing how when backwind is engaged it locks into the spool recesses. Note the tiny landing area that the copper brake acts upon. The complete brake end plate assembly. The complete brake end plate assembly showing the three arms of the copper brake. Malte Blohm was involved in many business activities including the importation and selling of motorcycles. He had an interest in sports fishing and this led him to explore the possibilities of making his own reels. With his close circle of fishing friends he managed to acquire the technical knowledge to develop his first reel in the 1940’s. 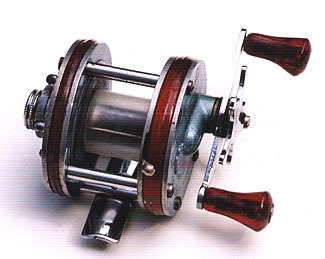 The reel was in either the Expert or the 500, we are not sure which, and differed from the majority of reels offered at the time as it had no level wind, it could also work in manual or free spool mode and came with a magnesium spool. 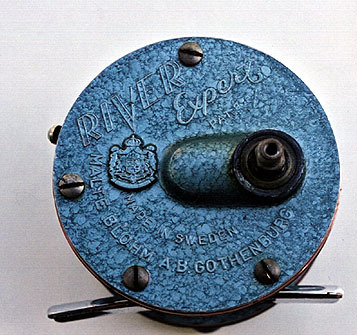 The River Expert reel shown from the brake side. The River Expert Reel box. Tournament casters soon sought after the reel and it’s fame spread by word of mouth. 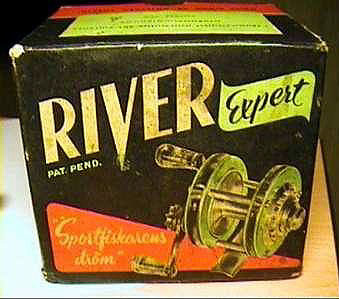 The River 500 a cheaper reel that offered many of the features found on the Expert followed this. Between 1953 and 1956 four more model were added to the range, and followed the traditional design by having a level wind fitted, the Royal, President, Favourite and Ideal. In 1956 a variant on the 500 was added and called the 600. The demand for the company’s products would eventually lead to its downfall. It could not complete all stages of manufacture and therefore decided to sub-contract some of it out. This resulted in a fall in the quality of the reels and eventually Malte Blohm sold out to his friend Gote Borgstrom owner of Abu in 1959. 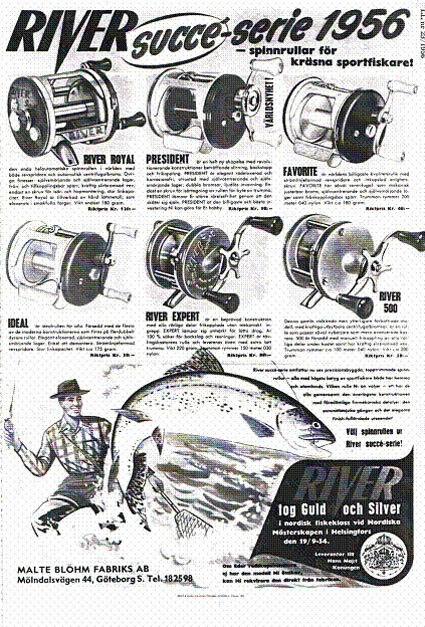 The company also made two close face reels the River Cast Elit and the River Elit 59 and there are a few prototype of a fixed spool reel in some collections in Sweden. As far as I know the company never produce a catalogue and marketing was always a low profile affair. Knowledge of the company’s product come from a few adverts placed in the publication “Levande Livet” in 1956. The company did receive the Royal Warrant and variant of the Expert can be found with or with out it. There is also a greyish green model with black handles. This entry was posted in River Expert Reel. Bookmark the permalink. hi i have found this infomation very interesting to read as i have a river expert pat number 936/4 i was wondering if they held any value, thanks adam. The one you got is the last variation of the RIVER Expert. I just bougth the early one. And look for information on the brake. The centrifugal brake on mine consist of two transparent plastic rods. Very interesting to see your pictures of the late Expert. hi i will try and take it apart to get some pics for you tonight all the best adam. Thought you might be interested? I’m trying to get a rough value for an older River Expert reel. The sides appear to be galvanized with a red recessed band between the external side and internal side. The reel knobs are red. Any advise or information would be very helpful.